Ten small round buttons, worked in silver-gilt thread, ornament each of the pockets of this brocaded silver-gilt and white silk coat. 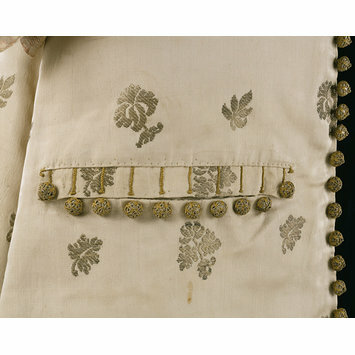 Pockets such as these were intended to remain open and were therefore furnished with purely decorative buttonholes and buttons. Tailors experimented with the shape and position of the pockets as the new fashion of closely fitted, knee-length coat and waistcoat developed during the late 17th century. Some coats have the pockets aligned vertically and others horizontally, although by the early 18th century the horizontal style prevailed. 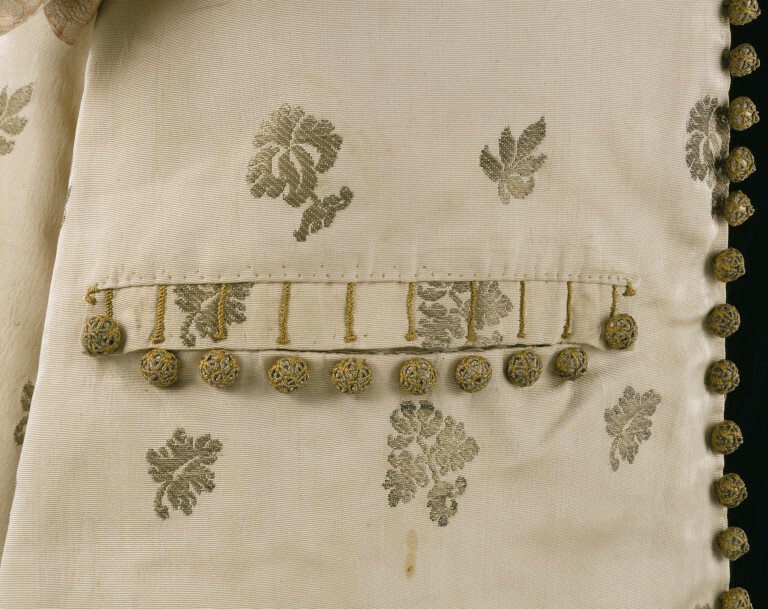 This coat forms part of the wedding suit of Sir Thomas Isham (1657–1681). He died of smallpox, aged 24, the day before his wedding and the suit was never worn. It is part of the Isham collection, acquired in 1900, one of the Museum’s earliest and most important acquisitions of 17th-century dress. This suit is reputed to have been made for the wedding of Sir Thomas Isham, which was scheduled for 9 August 1681. However, the bridegroom died of smallpox the day before the wedding.